Primary hepatic lymphoma (PHL) is a rare type of primary liver tumor and an unusual type of lymphoma. It usually presents with constitutional symptoms, hepatomegaly but without lymphadenopathy and extrahepatic (i.e., bone marrow, other lymphoid tissue, spleen) lymphomas. Because of the clinical and radiological resemblance of PHL to primary hepatocellular carcinoma (HCC) or metastatic tumor, PHL is frequently diagnosed intra- or post-operatively. Because of its rarity, non-specific clinical symptoms and radiological imaging, PHL was often misdiagnosed as some other tumor. Because chemotherapy is the treatment of choice of any lymphoma, adjuvant chemotherapy should be given to patients for optimal treatment. 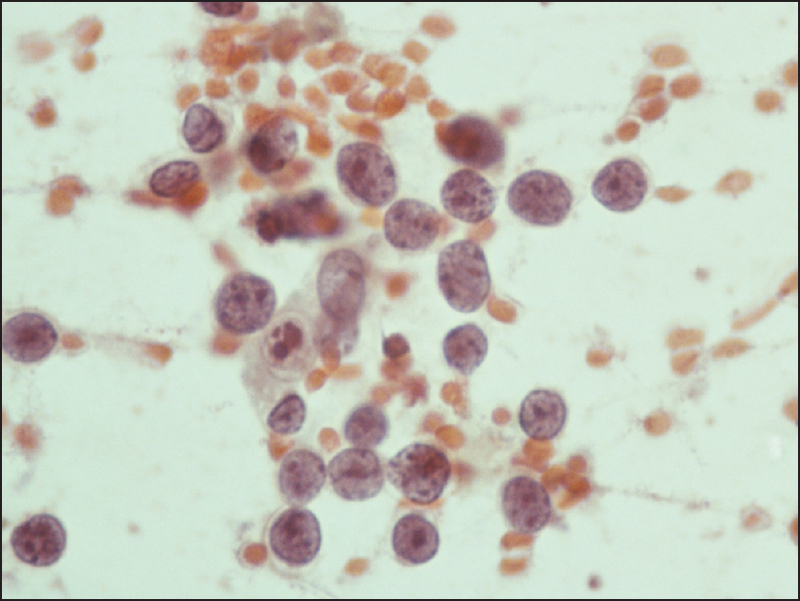 In this case report, we present a patient diagnosed as primary hepatic lymphoma on fine needle aspiration cytology (FNAC). A 60-year-old man presented with complaints of lump and pain in the abdomen since 2 months. On physical examination, gross hepatomegaly was present. Superficial lymph nodes were not palpated. Routine laboratory investigations were unremarkable, except for anemia (hemoglobin 10.7 g/dL). Serum alfa fetoprotein (AFP) level, serum lactate dehydrogenase (LDH) level and serum carcinoembryonic antigen (CEA) levels were within normal limits. Liver function tests were altered, showing elevated alanine transferase level, alkaline transferase level and alkaline phosphatase level. A computed tomography (CT) scan of the abdomen and pelvis showed an ill-defined iso- to hypodense lesion with specks of calcification in the caudate lobe, segment IVA, IVB, and VIII [Figure 1]. The spleen and gall bladder appeared normal and no evidence of retroperitoneal lymphadenopathy was seen. The possibility of primary malignant mass of liver was given. Serological tests for hepatitis B virus (HBV), hepatitis C virus (HCV) and human immunodeficiency virus (HIV) infection were negative. The patient was not immunocompromised. The CT scan of the thorax did not reveal any lymphadenopathy or mass lesion. CT-guided FNAC and biopsy from the liver mass were carried out. Smears were stained with Papanicolaou stain with standard procedure and were examined. The smears were moderately cellular, showing discohesive round, medium to large size cells having moderate to scanty cytoplasm, vesicular nuclei and small one to three nucleoli. Few cells showed nuclear membrane irregularity with deep indentation and lobulation. Tingible body macrophages were seen along with nuclear debris and necrosis. Discrete histiocytes and occasional normal liver cells were also seen in the hemorrhagic background. Crushing artifact was seen. No organoid pattern was seen. The possibility of a non-Hodgkin lymphoma (NHL) was given [Figure 2]. Considering the rarity of PHL, bone marrow examination and further work-up was advised. Immunohistochemistry was followed on tissue biopsy. LCA, CD 20 and CD 79a were positive while CD 5 and CD 23 were negative. Cytokeratin, AFP, chromogranin and synaptophysin were negative, and ruled out poorly differentiated carcinoma, HCC and neuroendocrine carcinoma. The bone marrow showed normal cellularity with tri-linage hematopoeisis, with normal maturation and proportion. Neither superior or deep lymphadenopathy nor any additional foci of lymphoma were found anywhere else in the body. Thus, a diagnosis of primary non-Hodgkin lymphoma of the liver, large cell type (diffuse large B cell lymphoma - DLBCL) was confirmed. Our patient was advised to take six cycles of cyclophosphamide-hydroxydaunorubicin (Adiramycin)-oncovin (Vincristine)-prednisolone (CHOP). The first unequivocal case of PHL was reported by Ata and Kamel  in 1965. In 1986, Caccamo et al. defined it as a lymphoma localized and limited to the liver without extrahepatic involvement. According to them, the disease should be confined to the liver on necroscopy or, in a clinical setting, no palpable superficial lymphadenopathy or splenomegaly should be present; normal thoracic CT scan, normal bone marrow and blood counts should be recorded for at least 6 months after the appearance of the hepatic lesion, and it should be proven histologically. The case presented herein fulfilled all the above criteria. PHL is very rare, comprising only 0.016% of all NHLs and 0.4% of all primary extranodal NHLs. The incidence of hepatic involvement in NHL ranges from 16% to 22%. Therefore, a careful search to exclude other primary NHLs and PHLs should be advised. Liver biopsy remains the most valuable tool for the diagnosis of PHL. In the study of Lorenzo Memeo et al.,  diagnosis was made on autopsy in the 11 oldest cases, while recent cases were usually diagnosed from the resected specimen or a biopsy. In our case, cytology played an important role for the early diagnosis, and treatment can be started in the initial stages. In cytology as well, discohesive large round-oval cells with high N:C ratio, hepatoma and metastasis from the gastrointestinal tract or lung were the first possibilities. Normal levels of serum AFP and CEA are of some help, but still very few cases have normal levels of tumor markers. Thus, a definite diagnosis of PHL should include histology and immunohistochemistry study on biopsy. This case demonstrates the feasibility of diagnosing PHL on FNAC. There is no consensus on the optimal treatment for PHL. Surgical treatment, radiotherapy and chemotherapy were all reported as treatment modalities alone or in combination. The standard treatment for DLBCL is CHOP. The prognosis of PHL is considered very poor, with a median survival as low as 6 months for patients treated with chemotherapy alone. With the availability of the targeted therapy, complete response rate and prognosis have drastically changed in the last decade. 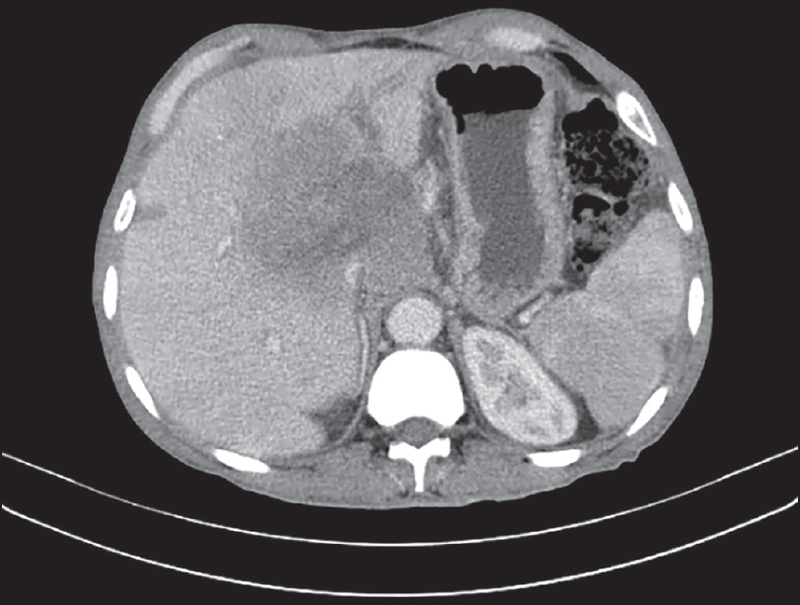 PHL should be considered in the differential diagnosis of space-occupying liver lesions, and FNAC provides an easier and faster method to diagnose such a rare case. The authors wish to express their thanks to Dr. S. N. Shukla, the Honorary Director and Dr. R. K. Vyas of the Gujarat Cancer and Research Institute to allow them to publish this case report. Freeman C, Berg JW, Cutler SJ. Occurrence and prognosis of extranodal lymphomas. Cancer 1972;29:252-60. Ata AA, Kamel IA. Primary reticulum cell sarcoma of the liver. A case report. J Egypt Med Assoc1965;48:514-21. Caccamo D, Pervez NK, Marchevsky A. Primary lymphoma of the liver in the acquired immunodeficiency syndrome. Arch Pathol Lab Med 1986;110:553-5. Civardi G, Vallisa D, Bertè R, Lazzaro A, Moroni CF, Cavanna L. Focal liver lesions in non-Hodgkin's lymphoma: Investigation of their prevalence, clinical significance and the role of Hepatitis C virus infection. Eur J Cancer 2002;38:2382-7. Bauduer F, Marty F, Gemain MC, Dulubac E, Bordahandy R.Primary non-Hodgkin's lymphoma of the liver in a patient with hepatitis B, C, HIV infections. Am J Hematol 1997;54:265. Page RD, Romaguera JE, Osborne B, Medeiros LJ, Rodriguez J, North L, et al. Primary hepatic lymphoma: Favorable outcome after combination chemotherapy. Cancer 2001;92:2023-9. Santos ES, Raez LE, Salvatierra J, Morgensztern D, Shanmugan N, Neff GW. Primary hepatic non-Hodgkin's lymphomas: Case report and review of literature. Am J Gastroenterol 2003;98:2789-93. Steller EJ, van Leeuwen MS, van Hillegersberg R, Schipper ME, Rinkes IH, Molenaar IQ. Primary lymphoma of the liver - A complex diagnosis.World J Radiol 2012;4:53-7. Memeo L, Pecorello I, Ciardi A, Aiello E, De Quarto A, Di Tondo U. Primary non-Hodgkin's lymphoma of the liver. Acta Oncol 1999;38:655-8. Netto D, Spielberger R, Awasthi S, Balaban EP, Nowak JA, Demian SD. Primary lymphoma of the liver. Report of a case with diagnosis by fine needle aspiration. Acta Cytol 1993;37:515-9. Masood A, Kairouz S, Hudhud KH, Hegazi AZ, Banu A, Gupta NC. Primary non-Hodgkin lymphoma of liver. Curr Oncol 2009;16:74-7.